Noticed a couple water delivery trucks on the street and wondered why people would waste money on Water Delivery services. This is definitely a big business and generates lots of revenue for companies. We have covered how unnecessary bottled water is in the past. Water delivery trucks use lots of fuel and generate pollution. Plastic Gallon Water Cooler bottles require lots of resources to make and recycle. Buying bottled water and schlepping it home is just as wasteful and costly. Paying $1 for a 20 oz bottle adds up fast. On average, people pay $2000 for a year of water delivery. The cost for the same amount of water from your home is less than $1. Should you filter your water? Are you filtering it for taste or safety? While the Environmental Protection Agency regulates municipal tap water and sets legal limits on certain contaminants, and most water utilities generally stay within these limits, “some of the US legal limits may be too lenient,” said Paul Pestano, a research analyst with the Environmental Working Group. And more than half of the chemicals found in municipal water are not regulated. Filtrete recently released an interesting Water Station that allows it to fill several water bottles at one time. Anything to get people off of bottled water is great to see. Water in most locales is safe to drink. Check the EPA’s site to verify. If your water has impurities that need to be removed for taste or chemicals like arsenic, lead, perchlorate, or atrazine, install a good water filter. We have an Everpure water filter system that cost a couple hundred dollars and works well. Just change its filter every so many months. You can request a copy of your water utility’s annual water quality report – called a right-to-know or consumer confidence report — to find out which contaminants in your local water are of concern. Some utilities will also run a free lead test on your tap water. You can then choose a filter that is certified by NSF International, an independent public health organization that assesses products. Note that it is not enough to buy or install a filter; you need to replace or maintain filters according to the manufacturer’s recommendations. Everpure has recycling info if you call them. They say you can recycle their filters along with normal curbside programs as the container is aluminum. The closest recycling center is in Carson, CA. Hopefully they will extend this program nationwide. Amazon sells low cost water filters from $15. 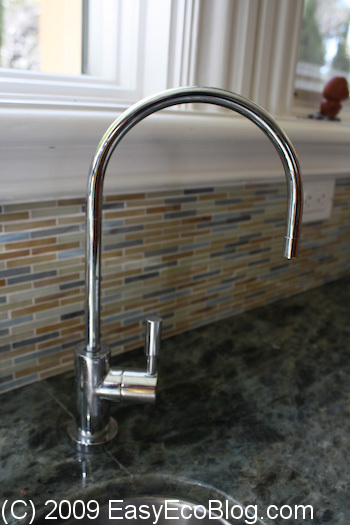 Choose from pitcher style ones from Pur or Brita or faucet mounted models. Save hundreds of dollars over bottled water each year. There is no guarantee that the bottled water is better than filtered water you can generate. Environmental Working Group has a page on helping you with filtered water tips. Be sure to use a BPA Free water bottle to drink your water. Save money by just saying NO to Water Delivery and Bottled water. If you use a Brita water filter system, make sure you recycle the filter. Here’s a cool little tool. SteriPEN Handheld Water Purifier destroys viruses, bacteria and protozoa–including Giardia and Cryptosporidium–using ultraviolet (UV) light in 48 seconds. 90 seconds for 32 ounces of water. This is a great little tool for those traveling or camping in the wilderness. This might be useful for those with bad municipal water systems. Water fountain makers have noticed that people are filling their water bottles at public drinking fountains with much more regularity. Companies like Elkay, Haws, and Oasis are finally selling new water fountains designed to refill bottles. These new bottle filling stations work much faster than the old water fountains, filling 16 ounces in 5 – 7 seconds. Some water fountains even have digital counters showing how many bottles have been filled. The one downside, people are buying less bottled water! Do you Think all Bottled water is Safe? Environmental Working Group has a report that their Oakland office tested 10 brands of bottled water and found that Wal-Mart’s Sam’s Choice contained chemical levels that exceeded legal limits in California and the voluntary standards adopted by the industry. They also have articles on why bottled water is a no go. Would you believe that bottled water sold at a San Francisco Bay Area Wal-Mart came from Las Vegas? Don’t they have a drought problem? 9 billion gallons of bottled water were consumed in 2007, with less than 50% divulging their source. On average, this water cost $3.79 per gallon, almost 2,000 times the cost of tap water. Many families waste over $1,000 a year on unnecessary bottled water. This is a waste due to all the energy used to manufacture, transport, and dispose of bottled water. Considering bottled water does not offer better quality than tap water, costs MORE than gas, and drains the environment, just say no. Use a Brita water filter if you are concerned with your tap water. Fewer than 15% of water bottles are recycled, leading to a big waste of resources. The CamelBak BPA-Free Better Water Bottle is a low cost water bottle that I switched to. No more buying bottled water and no BPA. Stainless steel water bottles are also a good bet. Just make sure they have no plastic interior liner or BPA liner. EWG Finds Toxic Hex-Chrome in 31 Cities Drinking Water. Hexavalent chromium, a probable carcinogen that was made famous by the film “Erin Brockovich.” States and the Federal Government have not set limits on this chemical. Hexavalent chromium was a commonly used industrial chemical until the early 1990s. It is still used in some industries, such as in chrome plating and the manufacturing of plastics and dyes. The chemical can also leach into groundwater from natural ores. San Jose was on the list of cities with poor water quality. Make sure you use a water filter in your drinking water. You may need a Distiller to filter out the Hex-Chrome. Got sick on an airplane flight? It could have been the water. The EPA has just published the Aircraft Drinking Water Rule (ADWR) to ensure that safe and reliable drinking water is provided to airline passengers and crew. What prompted this was that in 2004, the EPA found all aircraft water systems to be out of compliance with the national primary drinking water regulations (NPDWRs). According to the air carriers, it is not feasible for them to comply with all of the monitoring that is required in the existing regulations. Subsequently, EPA tested 327 aircraft of which 15 percent tested positive for total coliform. EPA considers this to be a high percentage of positive samples. In response to these findings, EPA embarked on an accelerated process to tailor the existing regulations for aircraft public water systems. In the interim, EPA placed 45 air carriers under Administrative Orders on Consent (AOCs). Until the final ADWR compliance dates, air carriers remain subject to the existing NPDWRs and AOCs where applicable. It is great they are beefing up the system. You can play safe by bringing an empty water bottle with you. Fill it at the airport at water fountains located after security. Make sure you use a BPA free water bottle. i’m sorry, but i just do not agree entirely. home delivery is wasteful, but there are alternatives!!! have you ever heard of bottle exchange programsm?? i have been a customer of a water delivery company for two years now, and i just upgraded a new model of their new water cooler/heater! i do not do their home delivery, i only use their exchangee system at my local LOWES. i am on a rampage to tell everyone to get OFF the 20 ounce bottles of water and convert to the 3/5 gallon bottles. it has changed our family’s life, and it has saved us so much money this passed year!!!! when the recession hit we had to shed our single serve bottle habit. we eventually switched to the 3/5 gall delivery and have lost weight, saved money, and now we have money to do other things we might not have before. and we look good doing it too, cause we lost all of that weight from sugary drinks! Companies selling bottled water have done a great job marketing it as healthy water, while selling it for approximately 5 cents an ounce versus tap water which costs less than 1 cent per gallon! Marketers of bottled water have convinced us that as compared to tap water, bottled water is pure, superior in taste and far more available. So how do help change people’s perception of tap water, while also providing them with the security the masses have come to associate with bottled water? Installing a whole house water filter or commercial water treatment system will help optimize water quality, help to minimize our reliance on natural resources, including oil used in the manufacturing and transportation of plastic water bottles, and offset our impact on the environment, reducing the generation and disposal of plastic bottles. Over 75% of all water we drink is away from home. Why in the world would someone pay for a water delivery company to drop of 5 gallon jugs of water? It takes almost 4 gallons of water to purify or filter 5 gallons of water. Not to mention the fuel and oil wasted to deliver it. Why not purchase a home personal portable water pitcher ($50) the filter lasts for almost a year. Or a self filtering water bottle that you can take on the go and the filer will last almost 10 months before you simply replace it. We sells such a product and they are FDA approved and USA Military used and tested. Thank you so much for the information about bottled water and how they are all not created equal! My wife and I always have bottled water delivered to us, and now we are going to examine the quality of the plastic. We almost always just refill the same plastic bottle, which does not seem the best after reading this article. Thanks for the great information!